We are coming at you today with the perrrrrfect DIY planner accessory you can make for your Happy Planner® to celebrate the new year! Design Team member Nita Patterson (@neatlyplanned) actually created these DIY planner clips earlier this year before being selected for the team, but we loved them so much, we asked her to submit them as one of her design team projects. We were waiting for an appropriate time to post about them, and going into 2017 with a celebratory 'party' theme is definitely it! Nita says, "Planner paper clips are to my Happy Planner® what a statement necklace is to my outfit ! It's a necessary piece! 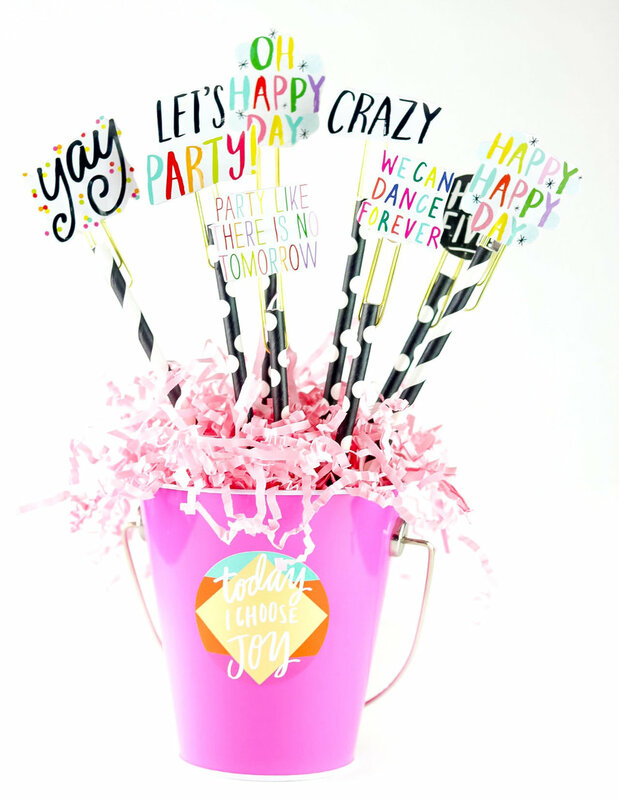 As planner babes we love to splurge, but we are also super resourceful -- and I crafted these fun planner clips using the sticker index on the back of the large mambiSTICKS™ packages!" "In every pack of large me & my BIG ideas mambiSTICKS quote stickers, there is a back page that shows you photos of each sticker (as shown above). I had the 'big idea' to cut those out and make planner clips out of them!" "Start by cutting out the individual quotes on the back of the sticker index. Next take the quotes and ahere them to one of the mambi POCKET PAGES™ using a glue stick. Be sure to leave the bottom open, add a dot of the hot glue and immediately place your paper clip in and seal the bottom...and WAHLAH! DIY paperclips perfect for my Happy Planner®." NOTE: We will not being linking to products from the mambiSHOP this week since it is currently closed. // We will be taking a physical inventory, moving the fulfillment center, and allowing our hard-working employees to spend the holidays with their loved ones. When it reopens on JANUARY 3rd, it will be re-branded as The Happy Planner® SHOP and will focus on planner product. The function will be the same, but will hopefully be a little easier to navigate. is going on NOW! Jump right in and participate!